TAG’s Aquaracers are known as quality watches for adventurous people. This watch truly exemplifies the quality for which the Aquaracers are known. It promises an excellent look, with an adventurous style, and lots of features for divers or sporty people. 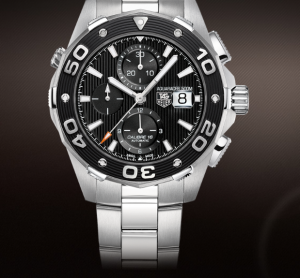 The Aquaracer 500MM, 16 Automatic Chronograph, 44MM has a black dial with vertical lines. It has three automatic Chronographs, displaying 60 seconds, 30 minutes, and 12 hours. The dial also has a magnified date display, and the TAG Heuer logo. The hands and markers are thick and luminescent white, and the second hand is metal with a orange arrow. This watch has large minute numerals, and small second ticks, so you can easily see the precise time. Overall the watch looks great, but it definitely is a sports watch. The dial is busy with three Chronograph displays, and a date display. However, nothing on this watch looks out of place. Everything seems to fit perfectly in one compact design. The black and silver make a fantastic classic look, but with a big splash of sportiness. Everything about this watch says ‘quality’, and it looks great, but if you are looking for something absolutely classic you might want to go with something different. Don’t let how great this watch looks deceive you. It is very durability, with sapphire scratch resistant crystal, and up to 500M of water resistance. With this watch you can be sure it will stand up to everyday use, and being exposed to water. On top of that this watch is accurate; measures up to 12 hours within 1/8th of a seconds accuracy. With a $2,500 to $3,000 price tag this watch is quite pricey, but with all the features this watch has it would have to be. For the superb water resistance this watch offers, and the automatic chronograph you will have to pay more. If you feel like those features are not something you need then you would better off with one of the cheaper models of the Aquaracers. For example the WAJ2110.BA0870 has many of the same features with a similar look without the Chronograph, and is about $400-$500 cheaper. If you are looking for a great watch with the very best features, then this is a great watch to have. While it may be more expensive than other Aquaracer models it is packed with amazing features. In addition, this watch is simply stunning, and is sure to look great in either formal attire, or casual, everyday clothes.